I know, I know...I have been MIA lately. Trust me I have my reasons. I'll let you guys in the loop later this week. But for now I wanted to take the time to just write a quick recap on my last race: The Silver Strand Half Marathon. 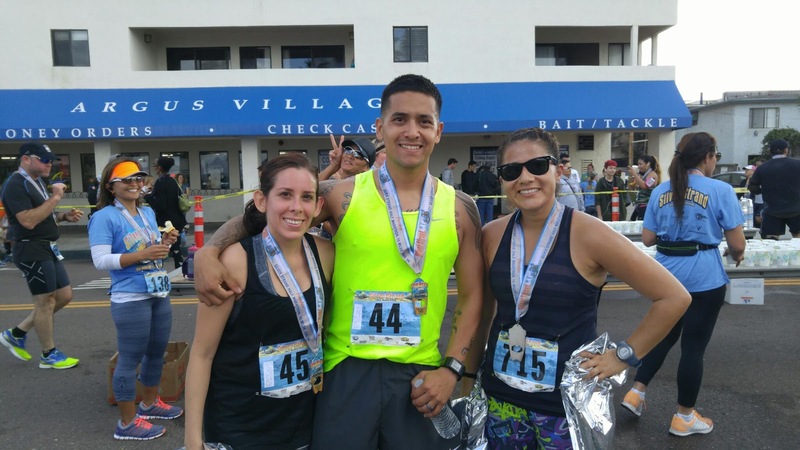 I ran this race a week ago today with some of my good friends from out of town, Sylvia and Andres. It was technically the last race I had in my calendar for the year. My plans to run the San Antonio Rock n Roll fell through a few months ago, so this race was the final one for 2015. 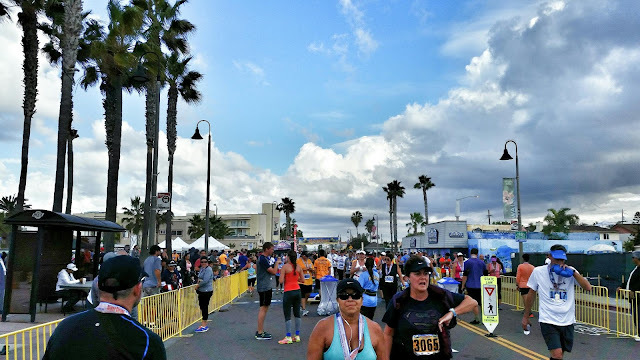 Since I now live in San Diego, finding runs and races around here is pretty easy. I swear you can find some 5k benefiting something almost weekly. I haven't ruled out running maybe a Turkey Trot or a Christmas 5k. But for sure no more half marathons for awhile. Time to give my knees some rest. 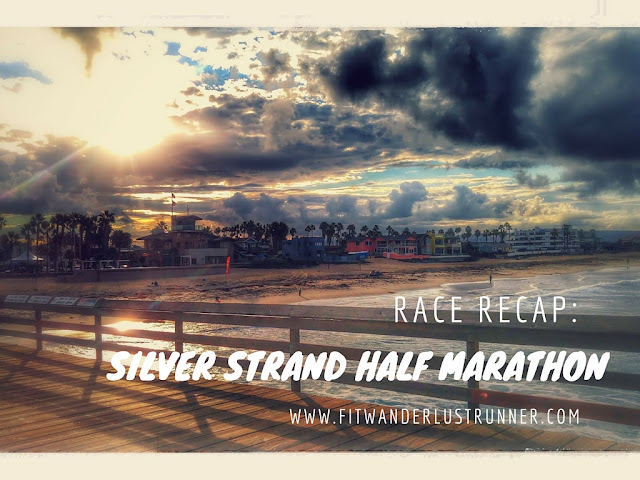 The Silver Strand Half Marathon is a combined event. It consists of a 5k, 10k, and a half marathon. The kind of cool thing about this race is that it is open to not only runners/walkers but to skaters, ellipticals/elliptiGO, hand cycles, and wheelchairs. The course is known for being really flat. It starts in Coronado and ends in Imperial Beach. 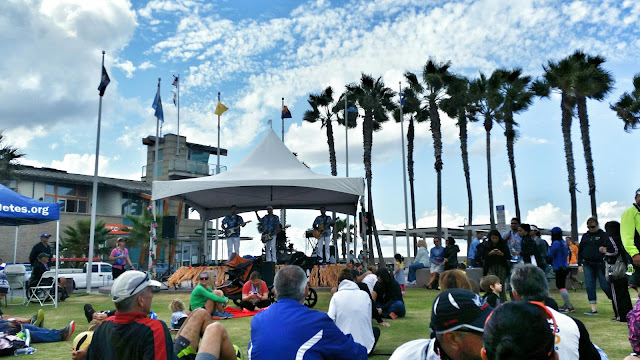 During the course you not only get to have Pacific Ocean views but views from the San Diego Bay as well. The course itself is what sold my friends on coming down for this race. We arrived at the start line about 45 minutes before the start time. There was limited parking there. They had suggested parking areas further away with shuttles but it comes in handy having your own personal driver. Thankfully my husband dropped us off and then headed to the finish line to meet up at the end. It gave us just enough time to use the restroom, warm-up and stretch. As usual the lines in the bathroom were long but it took me maybe 10 minutes so overall it wasn't that bad. It just seemed longer. The weather was pretty perfect. It was overcast and cloudy with cool temps. My fave! 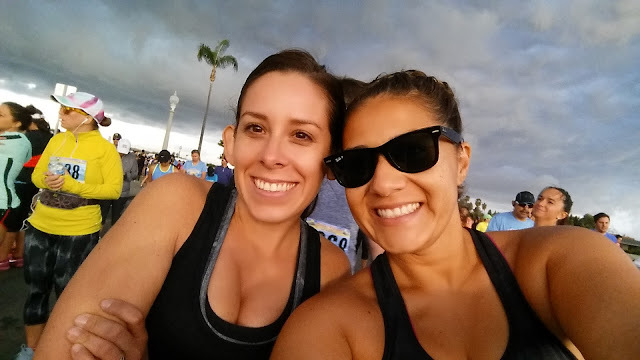 So we took a few pictures before the race, stayed towards the back and waited for the race to start. Sylvia's knee had been causing her a lot of pain lately so we wanted to keep it easy and light to not over due it. 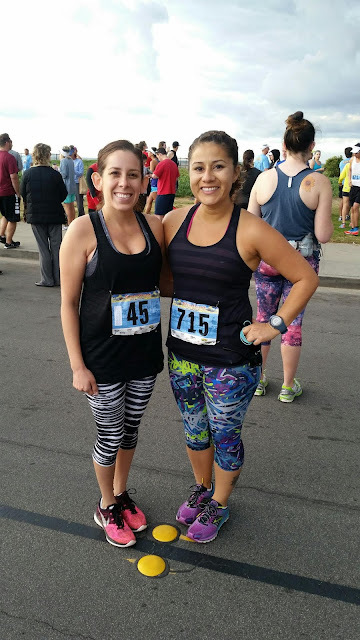 Since this wasn't a PR for me, I felt it would be a great way for both of us to run a race together. Now a little back story on my friend Sylvia. She used to be a runner and a fast runner at that during college. She however really didn't have a passion for it and just stopped. Her husband and I had been hounding her for years to get back at it. This year she finally agreed and I am so happy she picked this race! Okay the course was really pretty. Having views of the waves from the ocean to the still waters of the bay was sooting and relaxing. It was cloudy and overcast so not that much sun was out. There weren't that many spectators either since there really wasn't that many places they can cheer along the road. We started off with the 2:20 pacer but almost immediately passed that one up. I was kind of impressed our pace was pretty good. Before we knew it, we had passed the 2:10 pacer. I was actually shocked that our pace was better than we had expected. All of a sudden was had made it to the 8 miler mark, but that's when I just kind of started to slow down. I tried to focus on the fact that we were more than half way done, but I was losing fuel and fast. I had my GU gel packs with me but I refrained from taking any. I guess I should point out that I was having some major digestive issues throughout the entire race. I woke up beyond nauseous and with an upset stomach. I will have to say the worst were the last three miles. At the 10 mile mark the half marathons runners and the 10k runners broke away. We continued to run a small loop with a very small hill that felt like a giant mountain. We kept pushing each other but I knew I was done. We saw Andres around the last mile. He ran the final leg with us and told us he was shocked to see us. He expected us to be further back. He signaled my husband up ahead and then he ran with me. We could see the finish line and as much as I was giving it my all, I told Sylvia to go ahead. I just had no more in me. My final time was 2:07:09. Overall, I really enjoyed this race. It made it so much better having my friends and husband there though. I really didn't take any pictures during the course since I just kind of took in all the views. 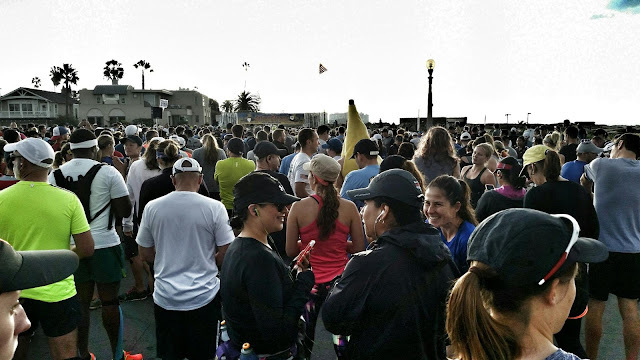 If you are a local San Diegan and looking for your first half marathon, I would highly recommend this one. Afterwards there was a beer garden and a live band performing. We stuck around for a bit, stretched, ate our post race snacks, and just kind of enjoyed the show. Andres came in fourth for his age group, missed placing by like 6 seconds! 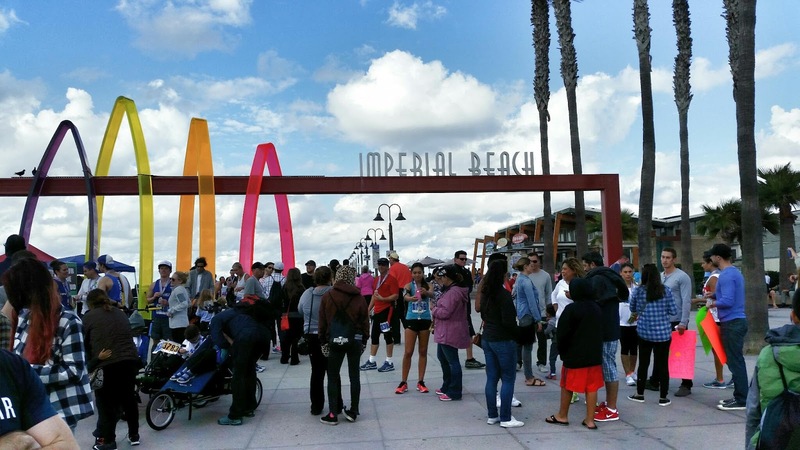 This race ends right next to the beach too so the great views just keep on continuing! Finish line entertainment: beer garden/food/live band/vendors/etc. Not many bad things I can say about this race other than they could have more bathrooms. To be honest I feel this way about every race! Afterwards we went to local bar/restaurant in Imperial Beach and refueled with some good food and some cold beverages. Since it was Sunday too, we made sure to watch some football. Overall it was a good race day spent with great friends. Cheers! Any one running a Turkey Trot? 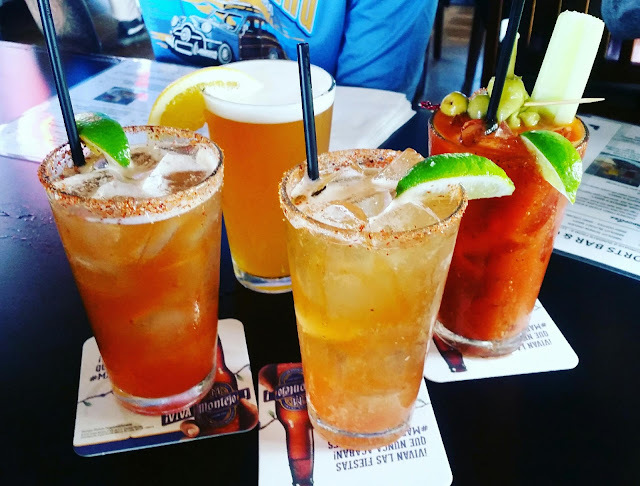 those drinks look like the perfect post race refreshment! dont you just love when you have a flat course, makes the race so much better! Thanks Rachael! The drinks were so refreshing post race. This looks like so much fun! Races are always better when you can share the experience with loved ones.